Announcing a Linea Pelle Giveaway! Update: Please note that the giveaway contest is closed — but the discount codes will be good through 8/31/2011! The good folks at Linea Pelle have extended a 20% off code just for Corporette readers: LPCORP20 for any full-price purchase of $150 or more (and get free ground shipping with code G3FREESHIP) (both offers good through 8/31/11). Note that you can also “Like” Linea Pelle on Facebook and sign up for their VIP newsletter to see more great deals from the company. Disclosure: Please note that Corporette charges a fee to administer giveaways. Great bag for anytime but would especially love to have for work so that I have room to carry everything! LOL! We’re a warm and fuzzy community until there’s free stuff! No threadjacks, no replies to comments, no nothing! What’s that supposed to mean? The point of giveaway posts is that comments should be reserved for entries. That way the owner doesn’t have to sort through comments that aren’t really entries in order to pick a winner. I sincerely apologize for offending you. Please do forgive!!! Ps – maybe lose the ‘tude if you’re posting your real email address in a very public place? I’d certainly carry it to city council meetings and work sessions–they run awfully long, and snacks and other diversions are required! I would use it as my every day bag – lots of room to tote around lots of stuff, always a good sign of a good bag. I would absolutely wear the bag to the office, and to dinner, and on the weekend… Nice choice! I’d wear it to work, and as someone who puts on events and conferences, it is essential to have a bag with lots of pockets to keep everything easy to find! Anywhere and everywhere! Just today decided I had to finally invest in a really great bag (always been a tomboy), and this would be a dream come true. I’d bring it on my honeymoon to Amsterdam in September! GOREGOUS bag! A leather bag of such high quality and in such a beautiful color would be appropriate just about everywhere, but I’d love to take it to work. It would handle all my daily needs beautifully! I would wear it everywhere. I’m about 10 years behind on the nice soft leather bag trend, so I don’t have any at all. Seems like a great everyday bag, and especially great for work — that’s how I’d use it. This looks like a great bag to carry to work. I commute & am always looking for great bags that will fit everything I need to take each day. Looks like a great bag to bring when I travel to conferences! I travel overseas quite a lot and always love a roomy bag as a carry-on/sightseeing catch-all. Everywhere. This bag is practical for commutting to work, and stylish enough to take out at night for dinner or drinks. Ooh pretty! Would be great for a busy Sunday – from brunch to visiting with friends to a cafe to read. I’d also definitely take it as my handbag on a flight; it’s chic but looks like it can fit a lot of odds and ends. Outer space, probably. JK no space program anymore. But seriously, I’d wear it to work, like everyone else. I am in love with the crimson color for this bag. I would carry this bag nonstop on weekends — brunch, shopping, dates, stopping by the farmer’s market. 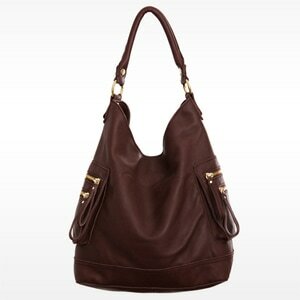 I love that it has that slouchy shopper shape but still looks structured! Also love the pockets, so I could stow my keys and phone and not constantly have to dig around the bottom of the bag looking for the essentials. I’m a lawyer constantly toting a laptop during the week, but on computer-free days (Fridays!) I’d dress this bag up for work too! What an awesome weekend bag! All of the pockets would keep me organized while I run errands, lunch with friends, shop, or catch a late summer baseball game. Looks like a great replacement for my anytime bag! I’d use this bag for work and traveling. Gorgeous bag. Part of my job requires me to tour offsite facilities with contractors. This bag would be perfect as it is not too bulky, but can still hold everything I need so I won’t have to take my large everday tote that’s more suited for files. I would wear it everywhere as I’m a single-bag kind of girl. I have one giant Gucci black leather bag right now that is my purse, briefcase, diaper bag, etc. So I’d carry it to work, the grocery store, out…you name it. Everywhere! I love a big bag. I generally keep two bags around: one for work and one for everything else. I’ve slowly transitioned my last beloved bag into my work bag (it just worked better than the work-specific bags I kept buying and getting tired of), so I’m in the market for a new “fun” bag. This one (in Midnight, I think) would be perfect. I’d carry it to work and on the weekends, also looks great for travel! Looks like the perfect bag for outings with the kids. Snack cups, sippy cups, a few energy bars, and we’re ready to hit the museum (or grocery store, or playground). It looks like a great bag to wear anywhere! I would carry it to work and for travel. I would definitely use this bag as a carry-on for my frequent business trips. So much room but sophisticated at the same time. I’d use this bag for work and on the weekends to run errands. I love the gold hardware and the side pockets – great for holding a metrocard or keys! Everywhere. Big enough to haul everything I take to work (heels, snacks, two cans of soda…), cute enough to take out with me on weekends. I would wear it to work for more casual days, and all the time on weekends. Look at all that room! Looks like a perfect commuting bag–big enough to hold work as well as a newspaper, a few magazines, or a book. This bag looks fantastic – a great bridge piece from day at work to evening to weekend, I think I would use it for all three! I really appreciate that it looks sophisticated, but sturdy, and like it can hold a lot without looking like you’re packing for the week! I can carry this everywhere! I teach HS, and would be the envy of the faculty. I also have a conference to attend in the fall and this would be serve as a great tote for the conference. I would use it as my day to day bag. It’s the perfect size and it would go with everything! This would easily become my everyday bag, fitting water bottles and lunch as well as blazers and heels. I’ve been toting around my canvas bag lately to fit everything and feel awfully out of place slinging it around the MTA, surrounded by all these gorgeous bags. I would wear this everywhere- to work in my business casual office and on the weekends for shopping, errands, lunch, etc. It’s a nice bag. I would wear it everywhere! What a great every-day bag! Lovely bag! Perfect for every day usage toting it around town!